For the fourth time in six years, the Chicago Blackhawks will be playing in the Western Conference Finals. After knocking off the highly talented St. Louis Blues in the first round, it appeared that maybe the second round wouldn’t be much of a test for the Hawks. However, the Minnesota Wild showed major improvement from 2013 when they lost in five games to the eventual Stanley Cup Champions. I had Sharp listed as a key for the Hawks last round and he only tailed one goal in the series. Although the Hawks have been able to win without much production from their regular season leading goal scorer, it is time for Sharp to start putting the puck in the net. After leading the Hawks in goals and points during the regular season, Sharp has just two goals in the first 12 games of the playoffs. Sharp gets paid to score goals and it’s time for that to happen. Goals will be tough to come across in this series as the Kings play a great defensive game and everyone knows about Jonathan Quick’s ability in net. Sharp has always been somewhat of a streaky player throughout his career. If he catches fire against the Kings, the Hawks will have a great shot at their second consecutive Western Conference championship. 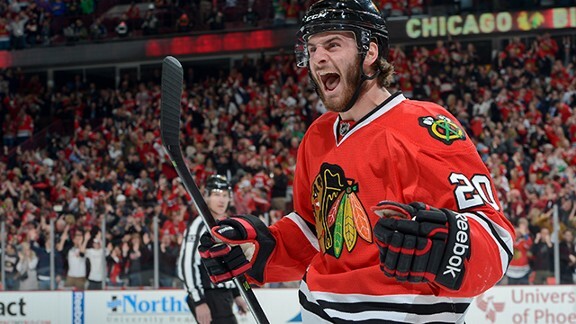 In his second full post season with the Blackhawks, I think Saad could be a big player for the Hawks against the Kings. With the Kings lockdown defense, the Hawks will need Saad to put hi skating strengths to work. The 21 year winger has great speed and ability to make plays along the board. In a series that will be very tight, Saad’s playmaking ability could be a big factor. The scoring numbers aren’t quite there yet but he brings so much more to the table. He has two goals and five assists through the first 12 games of the playoffs. It took him until the first game against the Boston Bruins last year to score his first goal. Don’t expect Saad to tally a lot of goals in this series but his ability to make plays without a lot of space will be something to Hawks need. Probably one of the most underrated defensemen in the NHL. Obviously playing along side Norris Trophy candidate, Duncan Keith, Seabrook doesn’t quite get the attention that his partner does. However, Seabrook is a huge piece of the Hawks team and they will need him to play great hockey. Everyone knows about Seabrook’s suspension against the Blues in the first round. Despite missing three games, Seabrook still posted two goals and four assists in the series. He then responded with five assist against the Wild. The Hawks will be counting on Seabrook to bring a physical presence against the tough Kings team. LA has had stretches during the playoffs when they really struggle to score goals. Being strong on the back end is a big key for the Hawks and Seabrook is right in the heart of that. The Hawks could also use him to help out on the offensive side of things. He had a goal in the series against the Kings in 2013. ← Mel Tucker and Reggie Herring Send Conflicting Schematic Signals. Sort of.